Hao123.com is a web browser hijacker that has several versions including tw.hao.123.com, en.hao123.com, br.hao123.com, and others. Each version is aimed at computer users from different parts of the world. The hijacker is compatible with all well-known browsers and it usually gets installed along with the Hao123 Toolbar. The toolbar is promoted at Hao123.ourtoolbar.com, which is listed as a webpage that contains potentially unwanted software that “can be deceptive and affect your system in unexpected ways.” That is exactly right, because after the toolbar gets installed, it alters your browser settings without your approval. We advise that you get rid of Hao123.com and its related program as soon as you can. Hao123 Toolbar is very similar to other plugins like Conduit Toolbar, Iminent Community Toolbar, Appbario Toolbar, and more. Although it has an official webpage, it also travels in free software bundles. The toolbar may be presented as an optional offer during freeware installation process. If you do not notice this offer, you agree to the addition of the program automatically. The same happens with other potentially unwanted applications. That is why it is important to always choose Advanced installation mode and pay attention to every step of the wizard, so that you can deselect the unnecessary components. Be sure to do that next time you acquire freeware or shareware. After the toolbar infiltrates your PC, it alters your browser settings. Your home page and default search provider get replaced with Hao123.com or a different version of this site depending on your location. The Hao123.com website is presented in Chinese, so unless you speak the language, you will hardly find it useful. Actually, even if you did speak it, it would still be best to eliminate Hao123.com from your browsers, because it contains lots of links, some of which are completely unreliable. The hijacker also has the ability to insert various ads into other pages that you visit and reroute you to sponsor sites. These activities will slow down your online surfing. 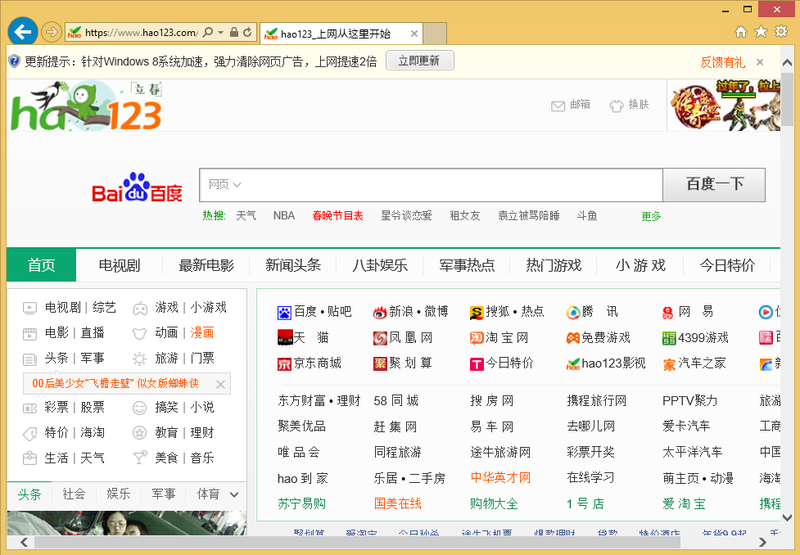 If you want to eliminate the unnecessary adverts from your browsers, you will have to terminate Hao123.com. In order to fully remove Hao123.com, you will have to uninstall its toolbar from your computer and restore your web browsers. If, however, you decide to go with a more effective solution and erase Hao123.com automatically, you will have to use a malware removal tool. The anti-malware utility, which you can acquire from our site, will perform a system scan and detect all potential threats. It will then delete Hao123.com along with them. In addition to cleaning your PC, it will also ensure its safety in the future by providing it with real-time online protection.